AFTER A FEW WEEKS of researching a trip to Thunder Bay in Northwestern Ontario, I realized there were so many opportunities for outdoor adventure that if I wanted to fit it all in — kayaking, hiking, mountain biking, a scenic flight over Lake Superior, fly fishing, learning to sail — I was going to need a strategic travel plan. Here’s what I came up with. Once I arrived in Thunder Bay I was stoked just to chill by the lake, and the best place to do that is at the newly established Marina Park. The park’s walking path runs along the shore of Lake Superior past eight public art installations, a skate park, and a splash pad. There are picnic areas, a marina, snack shop, and plenty of shaded grassy areas for lounging. But my favorite part of Marina Park were the views of Lake Superior and the Sleeping Giant — a massive rock monolith that juts into the lake and resembles a giant sleeping on his back. 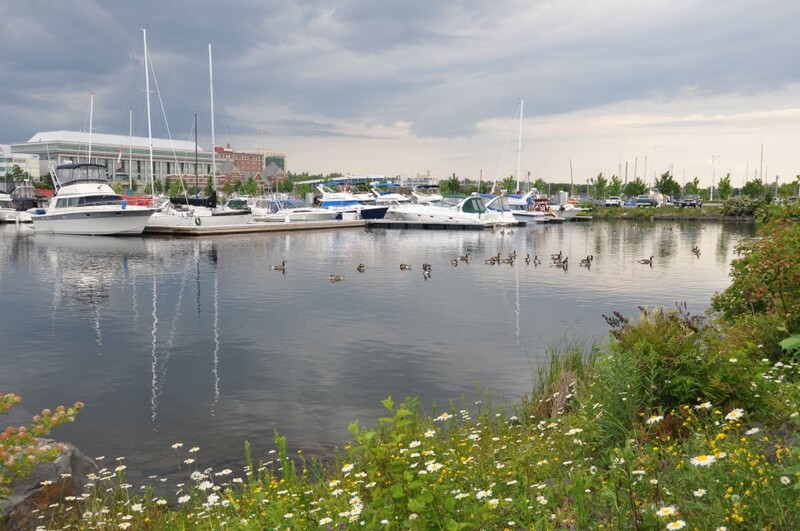 Depending on when you arrive in Thunder Bay, there are special events happening at Marina Park throughout the summer, including a Canada Day festival (July 1), the annual Blues Festival (mid-July) and the Summer in the Parks live music series, which takes place every Wednesday. If you can’t wait to get on the water, consider Sail Superior’s 90-minute harbor tour ($49 / person). From Thunder Bay’s Marina Park Lake Superior might look big, but once you’re flying over it with Wilderness North you’ll realize how gigantic it actually is. I lucked out and had a front row seat next to the pilot in the 1950s Turbine Otter converted WWI float plane. Once we were in the air, I dropped the window and hung my camera out. The hot afternoon made the ride a little bumpy, and if it weren’t for the fresh air on my face I might have lost my lunch. The bay is about 50km long and 22km wide and is situated on Lake Superior’s north shore. From the air, the rock formation on the Sibley Peninsula looks less like a sleeping giant and more like a guardian of the bay. A chain of volcanic islands extends from the Giant to the mainland on the southern edge of Thunder Bay. 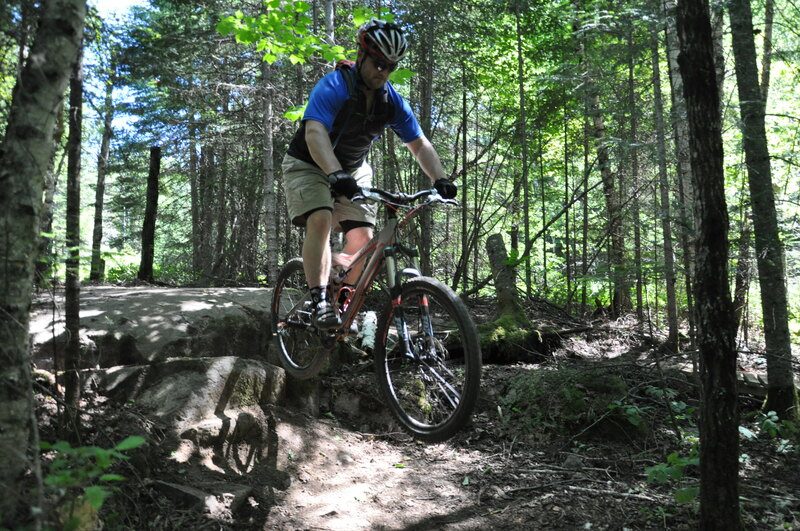 After your morning flight, head up to Centennial Park and the Shuniah Mines for a mountain bike ride. There are just 20km of singletrack in the park, but with 20 trails it’s easy to combine a few routes to keep pedaling for hours. The local Black Sheep Mountain Bike Club maintains and builds trails to International Mountain Bike Association standards. A variety of technical obstacles and trails are entertaining for any level rider. The club also hosts weekly cross-country and downhill bike races. After a few days exploring Thunder Bay, you’ll want to head north to Nipigon. The Nipigon River is home of the world-record brook trout — 14lb, 8oz. The fish was caught in 1915, and today the average brook trout is in the 8–10lb range. Still a solid fish. This watershed is considered the headwaters to the Great Lakes since it’s the single largest river flowing into Lake Superior. It’s about 48km long and 50 to 200km wide — so wide in areas that the river itself feels more like a lake, though submerged rocks and islands create multiple trout habitats and feeding zones. The Nipigon River basin is home to five Ontario species at risk, including the American white pelican, Peregrine falcon, woodland caribou, Eastern cougar, and wolverine. Moose, wolves, and black bears are common in the area. The wind was calm and the water like glass when I visited. I imagined trout-zilla hiding under the deep-cut banks in the water below. After a few missed grabs, my guide teased me. “Pay attention,” he said. I was distracted by the solitude and wilderness that surrounded me. Although the ultimate goal was to land a big brook trout, I was secretly more interested in spotting a wolverine on the horizon. Like trout, wolverines are predators and opportunistic scavengers. I tried to focus on catching a fish. My heart pounded with each cast and drag-free drift, but with each bite my delayed reaction left my hook bare. The Nipigon is about an hour north of Thunder Bay, and the scenery is worth the drive. Once you’re there, if you want to stay for a night or two check out the Quebec Lodge in Red Rocks. 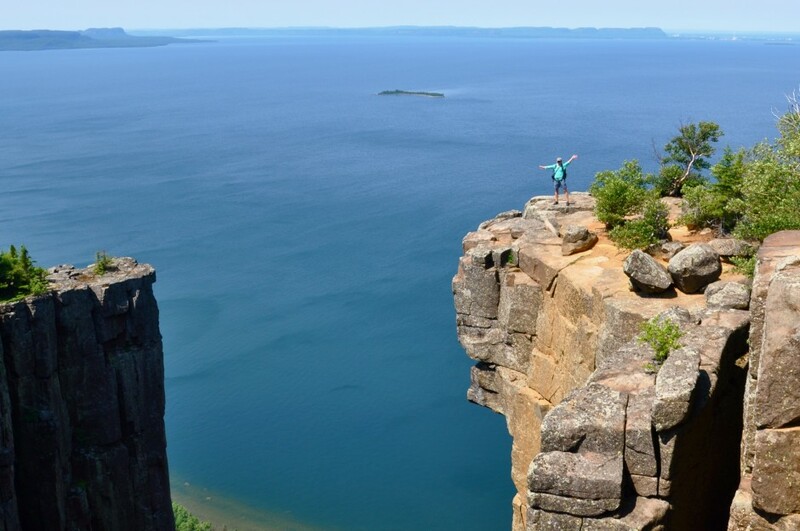 It’s situated above Nipigon Bay and has epic views of the lake. A short hiking trail leads up the hill to an unobstructed viewpoint and is a great spot for sunset. Since you’ve already made the drive north to Nipigon, get on the river again — this time in a kayak. My Epic Adventures kayak guide, Michael Elliot, was a Nipigon native and an excellent source of area information. Each guided paddle trip includes a one-hour lesson where you’ll learn basic kayaking technique and how to wet exit the kayak. Trips depart the Nipigon Marina, paddle down the river’s back channel to the calm flat waters of the Nipigon Bayou, and eventually end near the native paintings on the cliffs in Nipigon Bay. It’s 10km, usually takes 3-5 hours, and is suitable for beginner to intermediate kayakers. And if kayaking the Nipigon isn’t enough adventure, your guide can take you on a hike to a waterfall or on a mountain bike ride. Now that you’ve seen Lake Superior from the air, land, and kayak, it’s time to go sailing. You can choose to either kick off your sandals and enjoy the ride or actively participate, learning to sail on a multi-night trip on the big lake. Sail Superior Captain Gregory Heroux is a certified sailing instructor and has more than 30 years’ experience. 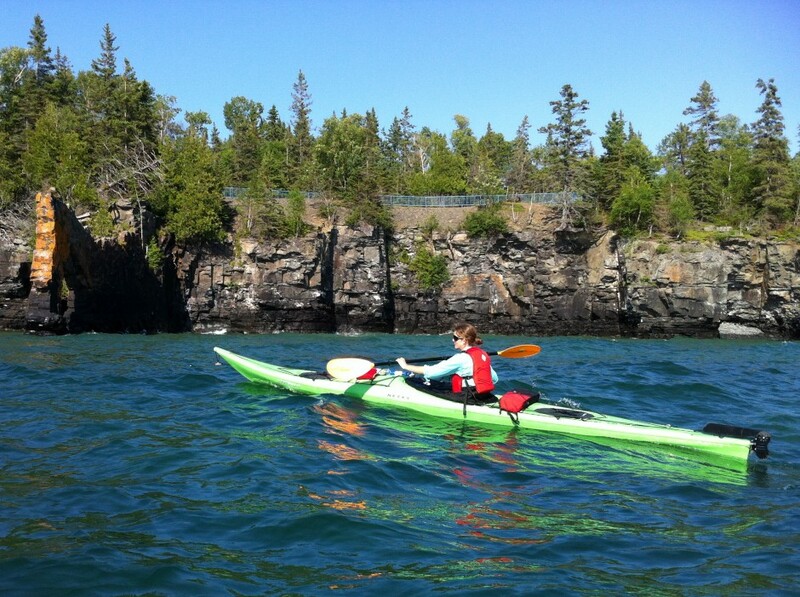 Lake Superior’s north shore has hundreds of islands and coves to explore. Thompson Island’s sauna is a good spot; be sure to take the cold plunge into the lake for a recharge. And if you spend the night at Tee Harbor in Sleeping Giant Provincial Park like I did, hike the Top of the Giant trail. The route climbs more than 900ft, ending in some pretty awesome lake views. Note: Hire the services of a chef for the multi-night voyage. I did and ate three meals / day of the best food I’ve had. 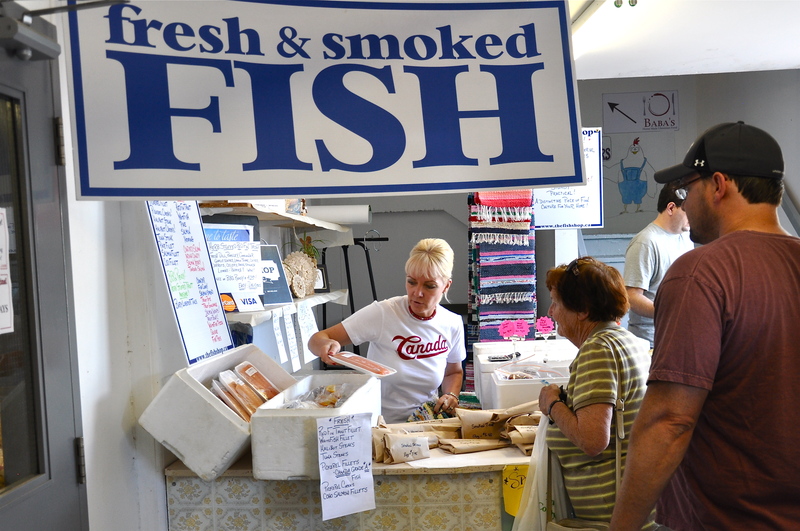 If you visit over the weekend, stop at the Thunder Bay Country Market for locally grown fruits and vegetables, smoked meats and cured fish, and homemade pasta sauces and preserves. The Thunder Oak Cheese Farm just south of Thunder Bay is another recommended spot. It’s a family owned and operated farm and the only gouda cheese producer in Ontario. The selection is fantastic and delicious. For a traditional home-style Finnish meal, try the Finlandia Club’s Hoito Restaurant. Housed in the historic 1910 Finnish Heritage building, the restaurant opened in 1918 and has been popular ever since, a Thunder Bay landmark famous for its authentic Finnish pancakes. Gargoyles Grille and Ale is a good place for live music. The menu features an eclectic selection of appetizers with seasonal ingredients. If you’re going to splurge for a B&B, McVicar Manor in Thunder Bay should be it. Hosts Dorothy and Tim Walch offer the most accommodating services and serve up a tasty breakfast. Located on McVicar Creek, within walking distance of downtown, McVicar Manor is an old Victorian home with spacious rooms that all have a private bathroom and jacuzzi tub.